When I first began taking action (re. cruising Google for info) on finding the best donair that Ottawa has to offer, a name that came up consistently was Centertown Donair & Pizza. It’s impressive that they not only have “donair” in their name, but also that it comes before “pizza”. Maybe it’s just alphabetical, but I took it as symbolic placement. From my hunger-inducing research, and my wife’s own interaction with the owner during a visit with some classmates, it turns out that he is not only a transplant from the Halifax area, but also owned a pizza and donair joint in Dartmouth years and years ago. It seems that he must be doing well by the donair, as the name of the restaurant has changed over time from Centertown Resto Bar to its current incarnation, and the sign prominently displays a Nova Scotian flag. With all the positive talk that’s *ahem* centered on Centertown, and its proximity to our apartment, my wife and I made our way there one cold Sunday night to sample their version of Halifax’s now-official food. It was dead quiet inside, although that wasn’t surprising at 90 minutes before closing on a Sunday, with another couple picking up an order being the only other people than one lone staffer. The interior of the restaurant is quaint, and staying on the Nova Scotian theme, has new-ish coats of blue and white paint perking things up. 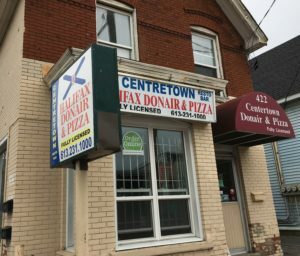 A full bar at the back seems out of place in a donair and pizza joint, but it’s likely a holdover from previous versions of Centertown and/or other tenants. But hey, you can’t argue with a place in Ottawa that has a liquor license, TV and donairs. Sitting down and scoping out their simple eat-in menu – nearly all of one side is dedicated to the various forms of donairs available – we settle on a deal that would give us two small donairs and two cans of pop for $14. Having heard that they also did garlic fingers here, we got a small of those, but without the reported facon (fake bacon) bits that were maligned online. Our cook/server kindly pointed out that their take-out menu had a deal for the same donair and pops that we wanted plus a medium garlic fingers, and it would cost slightly less than if we had gotten the small g-fings separately. Customer service win, right there. 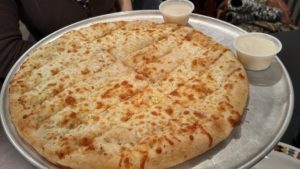 The garlic fingers came out after a short wait, attractively presented on one of those upraised pizza pedestal platters. The cheese was nicely browned in spots, and while the cups of donair sauce were begging to be dunked in, I had to try the garlic fingers on their own first. They were a bit on the greasy side, which also affected the crust, but were otherwise well-executed garlic fingers. The garlic flavour was actually stronger than most I’ve ever had, with the occasional burst of garlic really standing out. Definitely not a first date type of food, but having been with my wife for over six years now, we’re well beyond that. Dipping my carb and cheese sticks in the donair sauce, I found it to be a really good version of the sweet and lightly garlicky sauce that is essential for both garlic fingers and donairs. It was a bit thicker than some sauces back in Halifax, although not as thick as those in Pictou County, and hit all the right notes for flavour. Our donairs came when we were about halfway through the garlic fingers, which was just as well because we didn’t need/weren’t going to be able to finish a whole order and donairs as well. True to proper form, the donairs came rolled up in aluminum foil and I unwrapped one end to take a look at Centertown’s claim to local fame. 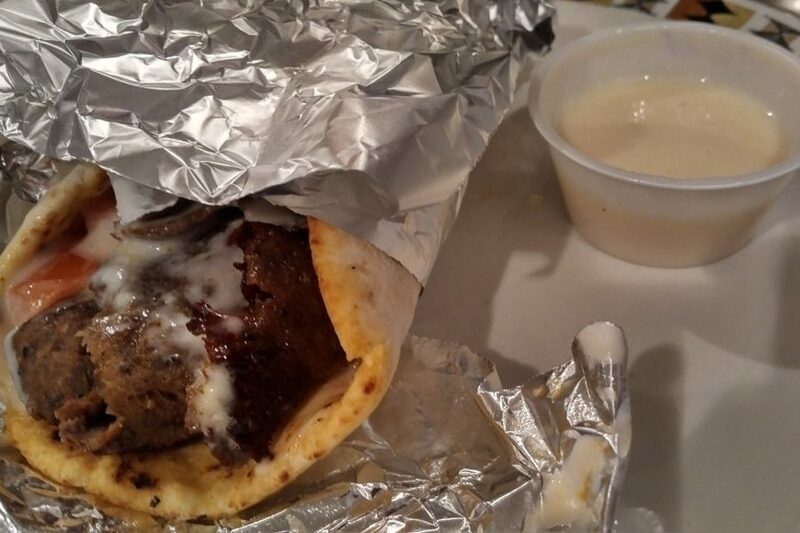 All the constituent parts were there – pita, diced onion and tomato, slices of donair meat, and a healthy dose of donair sauce. The meat looked like it was sliced a bit thick, and the pita seemed more substantial than those back home, but at least there wasn’t any of the blasphemous lettuce that some places in Ottawa use. As judgmental as I am, it’s what inside and how it tastes that really matters. The flavour seemed right on: it wasn’t as spicy as the likes of Tony’s in Halifax, but that earthy and spicy mix of flavour was all there. The slices of meat had a nice crispness around the edges from their finishing cook, but the texture was definitely a bit off from being sliced too thick. Had it been sliced thinner, it would have allowed the meat to have even crisper bits. Thin slices would also have filled out the wrap a bit more – although there was a reasonable amount of meat, it was not the heaping mounds that you get in Nova Scotia. 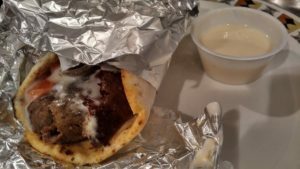 The donair sauce was used a bit more sparingly than in the homeland of the donair, as my plate was much cleaner, and pita more intact than what I’m used to. That said, I enjoyed the slightly thicker pita, which was somewhere between a hefty Greek pita and the thinner Lebanese ones. The diced onions and tomatoes rounded out the donair flavour profile, and brought a little zip and crunch. Service was a bit slow when we were done our meal, though the one lone guy was busy wrapping up last minute orders and getting ready to close. My wife said that when she was here previously, they just went up to the bar to pay, so up I went, and pay I did. It was a mere $25 plus tax for our hefty pile of edible nostalgia – a solid deal in my books. I chatted a bit with the staffer, who was the owner’s nephew, and I complimented him on their donairs and inquired about their origins, and he said they made every part in house, which is quite respectable. I’ll keep as open a mind as I can in my continued Ottawa donair quest, but my research on other offerings in the city leaves me with a bit of dread for what awaits. At least I’ll always have Centertown’s bar and kitchen a mere 10 minute walk away, where I can wash away memories of mediocrity with a beer and a good donair.